Elite Performance Ammunition From Sig Sauer lives up to its name round after round. The Sig V-Crown stacked hollow point design provides a smaller additional hollow point cavity behind the main cavity. This design along with V-shaped jacket skives and scores provides controlled uniform expansion at all effective distances and velocities. 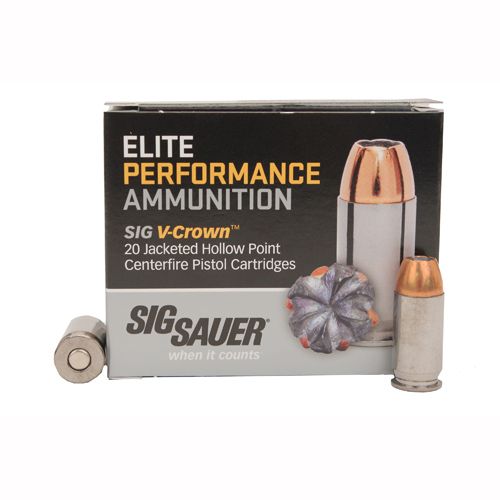 Each caliber loading of Sig Sauer Elite Performance Ammunition is precisely matched to the core temper of its Sig V-Crown bullet to ensure maximum terminal performance.